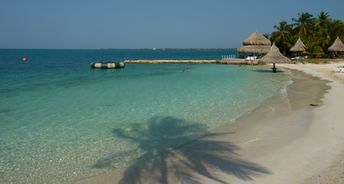 This beach ranks #2 of the "Best beaches in Cartagena"
Múcura Club and Punta Faro are the two hotels in Mucura island. Rooms' rates start at US$300 per night. However, significant discounts are available sometimes. Fly to Cartagena international airport (CTG). Next take a boat from Cartagena or from one of the smaller towns located to the south of Cartagena. In the region there are many tour operators offering daily trips to the paradise islands, - that are often called Islas del Rosario. If you plan to stay in the hotel, it is better to get from administration information about all possible transportation options. On the beaches of Cartagena the weather is great all year round - without heavy rains. In this regard, the region is unique, as in tropics it is usually a distinct rainy season killing any chance for a good beach holiday.